It's bracket season once again and we didn't want to leave the GUbers hanging after last year's hotly debated #MuffinMadness! This year we present to you a very special #MarchMACness! All you #MacsRacks fans, rejoice! Everyone had that certain childhood crush, whether it was an actress or maybe a singer. So let's decide once and for all who the definitive childhood crush is! Mac worked arduously to come up with the field of 64 and the four regions, deciding on the '1980s', '1990s', '2000s', and 'Singers'. We run through each region's seeding and matchups before ultimately giving you our "final fours" and eventual champions. Who were the biggest snubs? Who's winning it all?! 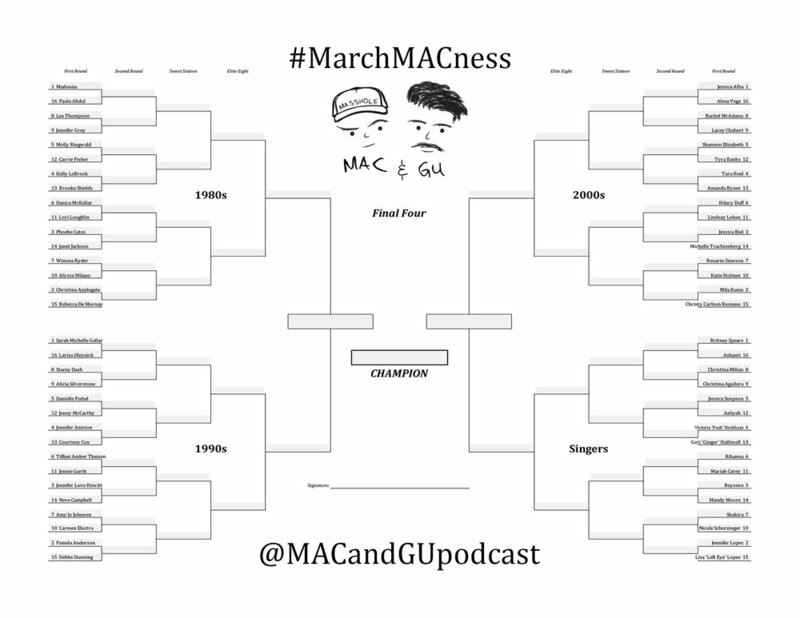 Be sure to fill out your bracket and submit it on Twitter to @MACandGUpodcast!